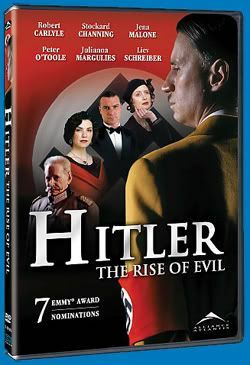 Hitler: The Rise of Evil (2003) RARE! Ini pula cerita mengenai kehidupan Adolf Hitler dari kecil hingga dewasa. Saksikanlah! Movie ni rare pasai hanya klua kat tv je.. The movie describes the life of Adolf Hitler from childhood to manhood, and how he became so powerful. It describes his poor childhood in Austria, it describes the first world war from his point of view, and how he became the strongest man in Germany. The movie show us how turned Hitler from a poor soldier into the leader of the Nazis, and how he survived the attempts to kill him. It describes his relationship with his mistress Eva Braun, and his decisions and enemies inside Germany and inside the Nazi party. USER BARU KLIK DI SINI!